One of the brightest and most waterproof flounder lights available. 1 year warranty. 12 VDC. Aluminum. 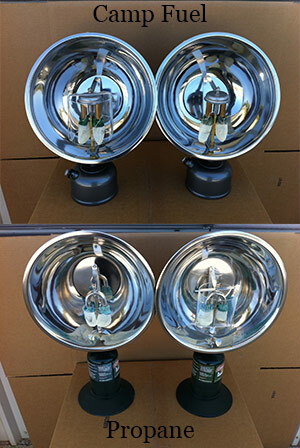 30 watt/3000 lumens @ 2.4 amp 40 watt/3000 lumens @ 3.3 amp. Very low profile. May be mounted for walking light or make your own system. Mount provided with bolt. Description: Great reflection. Perfectly angled handle. 1 Pkg. Mantles included.Propane style includes stand. Pyrex cover offered on both styles. Lightweight aircraft aluminum, with convex lens (rounded & magnifies), mountable (mount included) and it tilts, also submersible up to 10 feet. Manufacturer suggests that it is good for 35,000 hours. 1 year warranty from date of purchase for manufacturer defects. 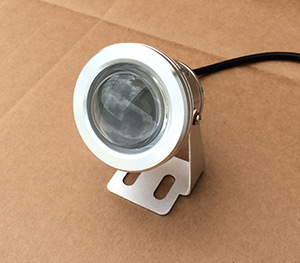 Description: Powder Coated Cast Aluminum.Stainless mounting brackets. Approx. 1650 lumens. Ideal for deck lighting. Water proof, non submersible. 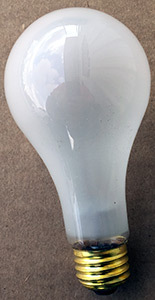 Description: 2.25 watts each. use adhesive backing or 5200 maine adhesive to mount. Waterproof, 12 Volt & simply amazing light quality!! Can be used on trim tabs, under gunnel, flooring lights, around steering area.... the list goes on and on. Description: 250 lumen spot light, 80 lumen flood, 10 lumen red light & flashing red beacon. Adjustable head strap & 1 yr. factory warranty. 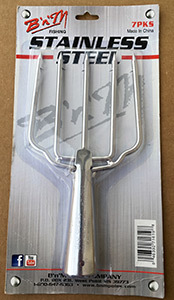 Great for frog giggin. 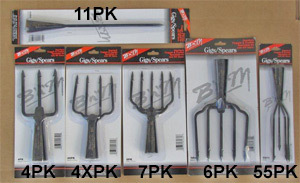 Description: B & M spears have been around for a long time!Perfect for flounder & frog gigging. 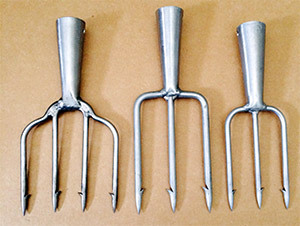 Description: Surgical Stainless steel hand crafted construction.With hand cut tines.Simply the best!